Why be the sheep when you can be the wolf? The is book is not a light read, with political schemes and murders a loft. 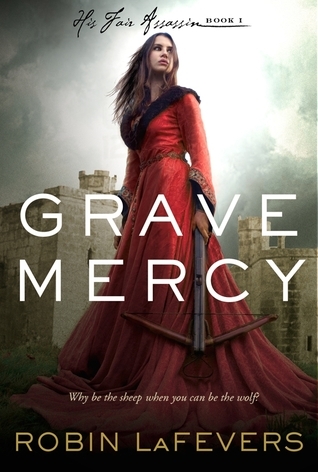 Grave Mercy by Robin LaFevers is a book for intrigue and historical details. Seventeen-year-old Ismae escapes from the brutality of an arranged marriage into the sanctuary of the convent of St. Mortain, where the sisters still serve the gods of old. Here she learns that the god of Death Himself has blessed her with dangerous gifts—and a violent destiny. If she chooses to stay at the convent, she will be trained as an assassin and serve as a handmaiden to Death. To claim her new life, she must destroy the lives of others. Ismae’s most important assignment takes her straight into the high court of Brittany—where she finds herself woefully under prepared—not only for the deadly games of intrigue and treason, but for the impossible choices she must make. For how can she deliver Death’s vengeance upon a target who, against her will, has stolen her heart? I read Grave Mercy by Robin LaFevers already last year after finding it in a very tight corner of the library. Loved it so much, that when I was thinking of what I wanted to read this year, this series already jumped to mind. Some might complain that the story is very feministic, which I will not deny, but I do not think it was meant that way. It is really about a woman coming into her own power and finding out there is also strength in love. I have read some reviews of people describing the plot line as “revenge-seeking woman becomes assassin”. I am completely against it. In the beginning Ismea is not a revenge seeking woman, she is a confused and disturbed girl. The best you can say Ismea is in the beginning is distrusting of men. The book is written in the first person of Ismea. Who grows, in the convent, into a young woman with a strength and a secret. A sharp blade, so to say, killing the people marked by St. Mortain. She then grows into a woman with loyalty, selflessness, fierceness and compassion. Her growth makes me really feel like I am reading about history, not just a story. She has her insecurities, but also great strengths. She has doubts, for example in love. The POV brings across a sense of urgency and makes the reader live with the characters. Also the historical details are so true, it is great to read about history is such a way. I have the advantage of really liking the time period. This entry was posted in Book Review and tagged Adventure, Book Review, Fantasy, History, Robin LaFevers, Romance. Bookmark the permalink.